Have we move beyond the single-use plastic shopping bag? (iStock)Toronto city council surprised everyone, including the mayor, when it voted to ban plastic bags outright by 2013. Mayor Rob Ford introduced a motion to eliminate a mandatory five-cent fee the city brought in three years ago. The motion passed, but so did another to eliminate plastic bags entirely by Jan. 1, 2013. Toronto isn't the first Canadian city to ban single-use plastic bags. Fort McMurray, Alta., banned the bags in 2010. Tofino, B.C., has had a voluntary ban on plastic bags for years. Los Angeles, San Francisco, Portland, Seattle and Hawaii have all banned plastic bags in the U.S., as have countries such as Italy, Bangladesh, Ethiopia, Rwanda and the Republic of Congo. And certain retailers don't offer plastic bags at all, including Thrifty Foods in B.C., liquor stores in Ontario and Ikea stores in Canada, the U.K. and elsewhere. 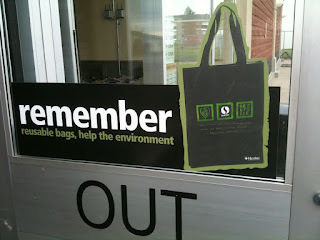 A federal private members' bill tabled in 2010 proposed that Canada should ban plastic shopping bags, but it was defeated. Legal threats led to what advocates called a sad decision for the environment. As of July, 2015, Hawaii will become the first U.S. state to bar the "modern day tumbleweed" known as disposable plastic bags. 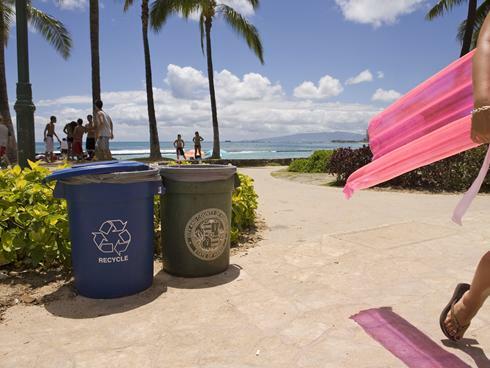 This month's move by Honolulu County bans non-biodegradable plastic bags at checkout, along with paper bags that aren't at least 40% recycled, reports MSNBC.com. Kauai and Maui counties already enforce bans, while Hawaii County's ban takes effect Jan. 17, 2013. 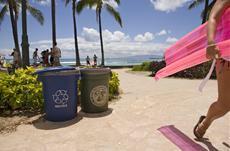 A beach goer holding an inflatable raft walks past a set of trash can set on Waikiki, in Honolulu. 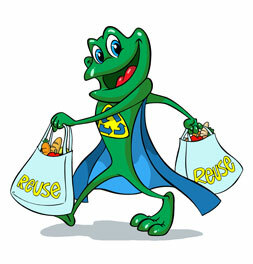 Effective Jul 15, 2013, Hawaii will become the first U.S. state to have a statewide ban on sales of single-use plastic bags at checkout. Honolulu's restrictions passed after a two-year campaign by the Sierra Club, an environmental group, and come as the Scripps Institution of Oceanography reports that the amount of plastic debris in an area of the Pacific Ocean known as the "Great Pacific Garbage Patch" has grown a hundredfold over the past four decades. bans non-biodegradable plastic bags at checkout as well as paper bags that are not at least 40 percent recycled. Retailers in Honolulu County have until July 1, 2015, to make the change. That date "gives us plenty of time to get ready," Carlisle told msnbc.com. "Retailers will be able to use up their inventory of bags and make arrangements to educate the public on the importance of bringing their own bag." Kauai and Maui counties already enforce bans, while Hawaii County's ban takes effect on Jan. 17, 2013. Last month, meanwhile, SeaWorld announced it will eliminate plastic shopping bags at its 10 theme parks within the next year. An estimated 1.4 billion tons of trash, including plastic bags, enters the ocean each year. Marine animals such as sea turtles often mistake plastic bags for jellyfish, one of their favorite foods. City Council approved the proposed amendments to the Single-Use Bag By-Law. Basically, the same stores will be able to give out bags (restaurants, liquor, pharmacy). The thick plastic bags that Reitmans and Marks give out are still allowed. Sean Graham, the initiator of the ban, was not in favour of the amendments, as he feels there will be bags everywhere now, and that too much will be up to the discretion of the store owners. But, we're well on our way to still being the best community for bag consciousness. So, remember your bags! City Council is looking at amendments to the Bag Ban By-Law. Check out the proposed ammendment. An outcome of the Bag Ban is that many cheap bags are available at stores. People often will buy a $1 bag when they forget one, and now have too many bags floating around their houses. Students and staff at Ecole Dickinsfield School came up with an innovative solution the problem: Take a Bag, Leave a Bag. Modelled on the "Take a penny, leave a penny" idea, customers can bring their extra bags to stores to leave in designated boxes. If they forget a bag, they can grab one. 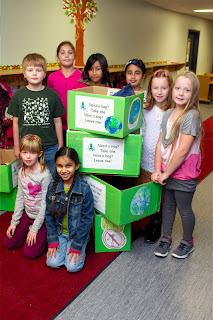 Students, staff and parents are excited with this idea. Check out the Today Paper article. Single-Use Bag Ban is staying! On October 25th, 2011, City Council reviewed the results of the survey done to see if citizens continue to support the Single-Use Bag Ban. 56% of people were in favour of the ban, 37% opposed, and 7% neutral. Of businesses, about it was about half and half for and against. After a thorough discussion, City Council voted unanimously to continue the Bag Ban. Recommendations for modifications will come to council in March. See the Today Paper article here. The Bag Monster made a 5 minute presentation to city council on why we should keep the ban.